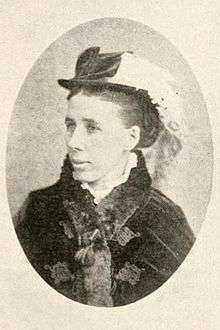 Constance Faunt Le Roy Runcie (or Fauntleroy) (January 15, 1836 – May 17, 1911) was an American pianist, author and composer. She was born in Indianapolis, Indiana, the granddaughter of Welsh industrial reformer Robert Owen. After her father's death, she studied composition and piano in Germany from 1852–61 and then returned to Indiana. Faunt Le Roy married minister James Runcie and had four children. The couple lived in St. Joseph, Missouri, where Constance Runcie founded a woman's club to further cultural development of the area. Her daughter Ellinor Dale Runcie was also a writer. Her papers are housed at Missouri Western University. ↑ "Constance Fauntleroy Runcie Collection". Retrieved 30 December 2010. ↑ Sadie, Julie Anne; Samuel, Rhian (1994). The Norton/Grove dictionary of women composers (Digitized online by GoogleBooks). ↑ "Constance Fauntleroy Runcie Digitized Collection". Retrieved 30 December 2010.